RadChart supports multiple Y axes. 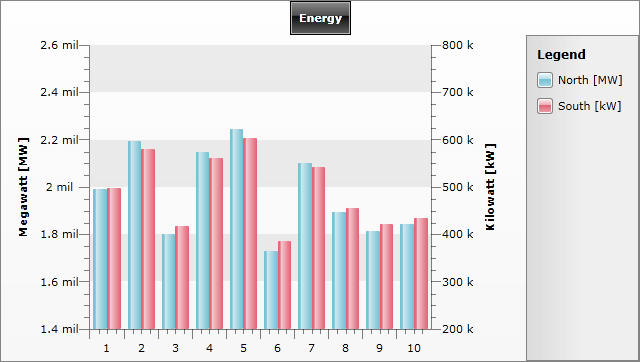 It may be required when series of a different scale should be presented on the same graph. The only thing you have to do is to specify which axis to be used for each series definition. To add more Y axes to a ChartArea, use ChartArea.AdditionalYAxes collection. Just create a new instance of AxisY, set a name using AxisY.AxisName property and add it to the collection. Add as many Y axes as you need. RadChart will arrange them one after the other. See Axes Overview and Y-Axis for more information. Now, having the required number of additional Y-Axis, you have to link each data series to the appropriate Y-Axis. To do that, simply use the ISeriesDefinition.AxisName property and set the name of the Y-Axis. If you leave this property empty, RadChart will use the default Y-Axis. First, a new AxisY is added to ChartArea.AdditionalYAxes with AxisY.AxisName set to "AxisY_South". Second, two series mappings are defined with CollectionIndex set to 0 and 1. See Data Binding to Many Chart Areas for more information. Third, for the second series mapping, SeriesMapping.SeriesDefinition.AxisName is set to the name of the additionally added Y axis - "AxisY_South".